Homemade Ice Cream is the quintessential summer treat, isn’t it? 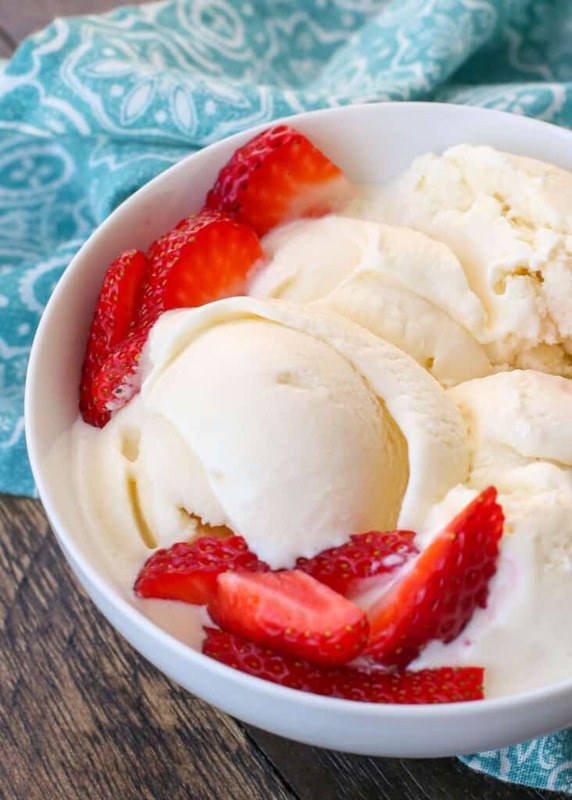 This homemade ice cream recipe can also be called the easiest (and best!) ice cream you will ever make or taste. I’ve been making this ice cream at least once a month for over 5 years now. Can anyone ever turn down a scoop of rich and creamy homemade vanilla ice cream? This ice cream recipe is the easiest once I make and it’s adaptable for whichever add-ins you’re craving. I try to keep a stash of crumbled cookies, brownies, and other treats in the freezer so that I can toss in a few handfuls whenever I’m making a fresh batch of ice cream. While homemade ice cream is a staple in our freezer year round, the add-in potentials for this particular ice cream are endless. I’ve filled this ice cream with chunks of brownies, bits of cookie dough, pieces of oatmeal cookies, and swirls of salted caramel sauce. I’ve also topped this homemade ice cream with warm chocolate sauce, and my favorite of all this simple berry sauce. There has yet to be a combination that we didn’t love. 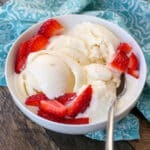 I probably don’t even need to mention it, but this Homemade Vanilla Ice Cream is a pretty much dream come true for topping Southern Peach Cobbler, Grandma’s Cherry Flop, an Old Fashioned Apple Crisp, or this Strawberry Rhubarb Crunch. With just five simple ingredients, you can have this smooth and creamy homemade vanilla ice cream at your fingertips as well. When I first started making homemade ice cream, I initially followed the recommended recipes and tried several custard-style ice creams. Traditionally, many ice creams begin with an egg custard. While a custard base does make for an amazing ice cream, don’t get me wrong, custard ice cream is rich as can be and I quickly found that it just isn’t my thing. Besides, I’ll be honest, I like to make things simpler and not more complicated in the kitchen wherever possible. When I discovered Philadelphia-style ice cream, it was a complete game changer. Philadelphia style ice cream is simply ice cream made with no eggs. 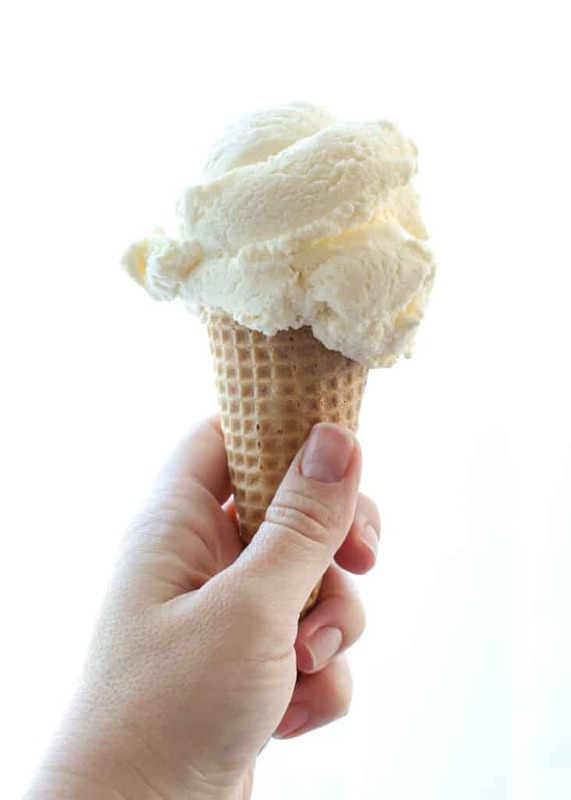 I’ve played with the basic ratios and the method over the past few years and I’m telling you now that this recipe is hands down, the BEST simple vanilla ice cream I have ever made. This ice cream is dead simple. Stir everything together in a saucepan, simmer, Stir, Chill and Freeze; less than 10 minutes of actual prep time. If I put the mixture together in the morning, and then freeze it in the afternoon, we are easily having this for dessert the same evening. However, if you are in a rush, you can simply stir everything together cold and pour it into the machine. I can’t deny that simmering it just long enough to dissolve the sugar and then cooling it again does makes it even better. Truthfully though, I’m impatient about half the time, so I skip the simmer step frequently. This is fantastic ice cream however you make it. This ice cream works beautifully in every ice cream maker I’ve tried. Hand crank, electric crank, freezer bowl, and ice cream compressor. Homemade Ice Cream turns out great in each one! Once you have an ice cream maker in your kitchen, get ready for all the ice cream recipes you can handle. These recipes for Rocky Road Ice Cream, Cinnamon Ice Cream, Blueberries and Cream Ice Cream, and Cafe con Leche Ice Cream all need to be on your list to try. Raspberry Ripple Ice Cream by The View from Great Island and Peanut Butter Ice Cream by Pint Sized Baker both look delicious as well. Pour 1 cup of the cream into a saucepan and add the sugar, salt. Scrape the seeds of the vanilla bean into the pot and then add the vanilla pod to the pot. Warm the mixture over medium heat, just until the sugar dissolves. Remove from the heat and add the remaining cream, milk, and vanilla. Stir to combine and chill in the refrigerator. When ready to churn, remove the vanilla pod, whisk mixture again and pour into ice cream maker. Churn according to the manufacturer’s instructions. Transfer the finished ice cream to an airtight container and place in the freezer until ready to serve. 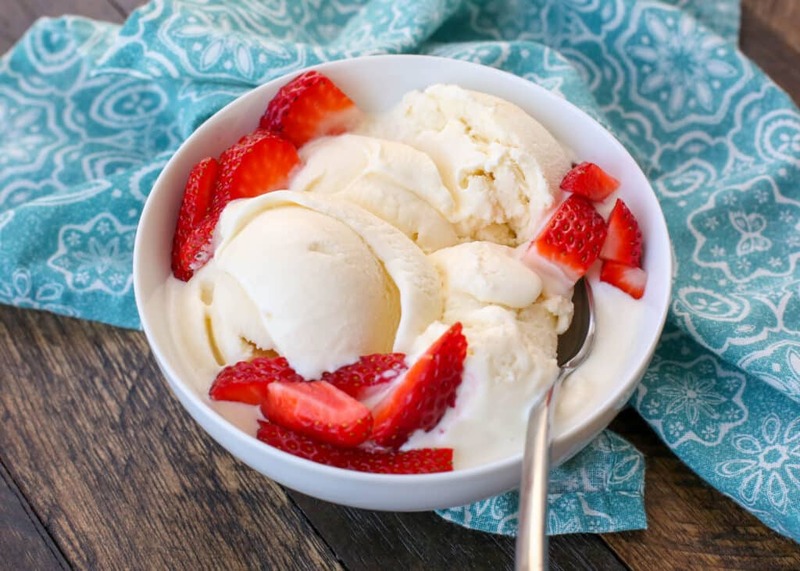 Rich and creamy homemade vanilla ice cream recipe that only requires five ingredients! Pour 1 cup of the cream into a saucepan and add the sugar, salt. Scrape the seeds of the vanilla bean into the pot and then add the vanilla pod to the pot. Warm the mixture over medium heat, just until the sugar dissolves. Remove from the heat and add the remaining cream, milk, and vanilla extract (if using extract). Stir to combine and chill in the refrigerator. When ready to churn, remove the vanilla pod, whisk mixture again and pour into ice cream maker. Churn according to the manufacturer's instructions. Transfer the finished ice cream to an airtight container and place in the freezer until ready to serve. Enjoy! Feel free to skip the simmer step and simply whisk everything together, then pour directly into the ice cream maker. The ice cream is absolutely delicious this way, as well as when simmered and chilled first. I made this last night for a post-cookout desert and it was the best homemade ice cream that I've ever had. Very creamy and tasty without the ice milk texture that the old recipe I used to use had. Everyone loved it! Sounds delicious! What should the consistency of the mixture be? Before freezing, it's just a thicker creamy liquid. I hope that helps! I noticed you have vanilla extract in the photo, but you use a vanilla pod in the recipe. How do you make this without the vanilla pod? Altho iit would be amazing, i'm sure, to use fresh vanilla, is just mor always affordable for me as we'r know pods are not cheap. Because extract is made with alcohol, how would I incorporate the alcohol based ingredient in with this recipe without compromising the texture? 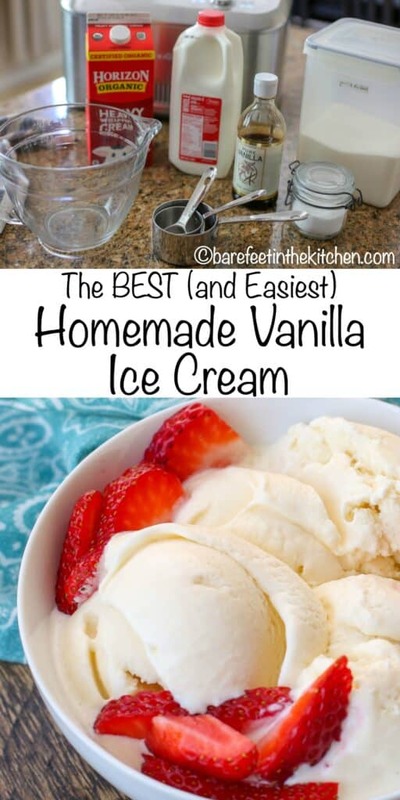 I make this ice cream all of the time, although more frequently with the listed vanilla extract simply because it is more affordable that way. Nothing else needs to be adjusted. Enjoy! This is not a no-churn ice cream recipe. Can this recipe be doubled or tripled without any trouble? The ingredients will easily multiply, but you will need to have a much larger ice cream maker in order to churn that much ice cream all at once. Enjoy! I made this recipe last weekend, but it was not enough for my ice cream freezer. I added a can of sweetened condensed milk and 6-1/4 cups of whole milk and it was fabulous! It’s now our family’s favorite ice cream. Yes, you'll use heavy whipping cream for this recipe. I don't use metric measurements, so you'll need to convert that using one of the online calculators. This recipe doesn't make enough for a full 2 qt ice cream freezer. You will need to double the recipe. If you were going to add fresh fruit to the recipe (say peaches as it is that time of year) would you alter any of the other ratios? So, here's the deal with adding chunks of fresh fruits to ice cream, it often has a very high water content and as a result, it freezes fairly solid and isn't always great that way. However, you can use this method to roast the peaches before adding them to the ice cream: https://barefeetinthekitchen.com/honey-roasted-peach-frozen-yogurt-recipe/ or you can go to a little extra effort and make this ice cream: https://barefeetinthekitchen.com/peach-cobbler-ice-cream-recipe/ it is one of my all time favorites. Can we use brown or white sugar ? Granulated or castor.. an specifics ? How long it did to fully freeze, please answer as quickly possible thanks! The freezing time will depend on your ice cream maker. There's no universal answer for that. Typically, most machines will churn in less than an hour. 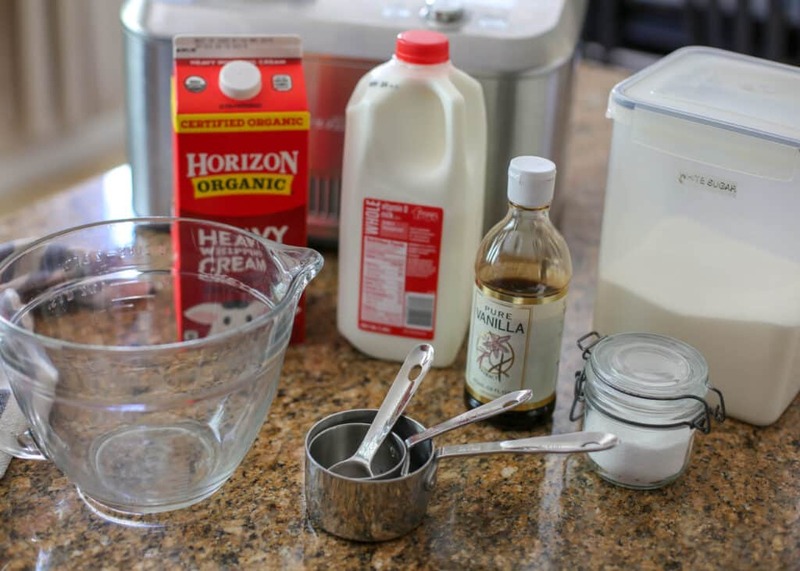 Can you use evaporated milk instead of whole milk? It will still work and freeze with evaporated milk, but I can not speak to how that will taste. This ice cream is amazingly easy and tastes fantastic. Made it twice in a week! Thanks for the great recipe! Can you make this without the nuts? There aren't any nuts in this recipe. Can you make this without nuts?